Over the past couple of years, there has been a surge in the budget Android phone market. Up until recently, many budget Android devices were… terrible, at best. 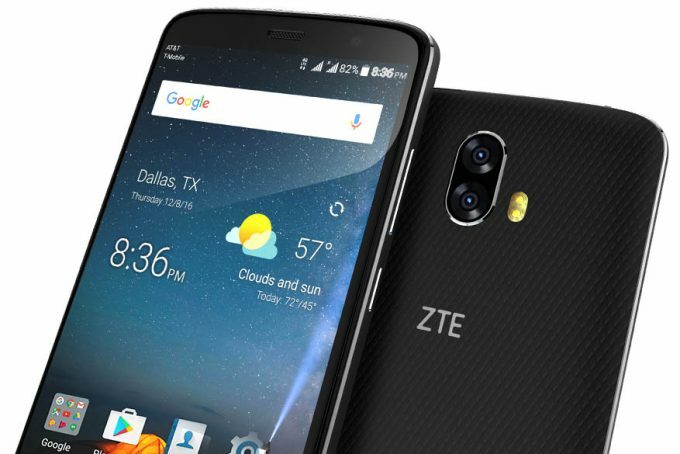 ZTE hopes to change that perception with its Blade V8 Pro, a $230 smartphone packing premium specs and a sharp aesthetic. Does it deliver? Let’s find out. Mobile phones have come a long way. As a Generation X’er, I have seen the entire progression from the bag phone, the famous Nokias that could survive a nuclear holocaust, to the phones of today. What a journey it has been, but enough with the “when I was your age” stories – let’s get to this review. As I have mentioned before, budget Android phones up until somewhat recently had a well-deserved bad reputation, but is this still the case? Recently, the market has seen offerings from OnePlus, Huawei and ZTE, to name a few. OnePlus currently only offers one model, the OnePlus 3T, but Huawei and ZTE offer many phones in a wide price range. These are the most notable specs; more can be found here on ZTE’s website. However, specs alone don’t tell the story, so let’s take a closer look. The fit and finish of this phone is absolutely premium, like a phone maker that has been at it for many years. The Blade V8 Pro is mostly black, with some polished/beveled aluminum, solid grey sides with slightly darker antenna bands, and a dark grey, almost black, textured covering that runs the entire length and width of the back of the phone. The front of the phone features an 8MP front camera in the upper right hand side, and just to the left of that is the earpiece speaker. The overall bezel is extremely thin, something you until only recently found on top-of-the-line phones. The home button has an integrated fingerprint scanner, and is a physical button, not capacitive. It sits nearly flush with the front glass, and is trimmed with chrome. The other two traditional Android navigation buttons are capacitive, are placed on either side of the home button, and are represented by small round lights under the glass. On the left hand side of the ZTE Blade V8 Pro we find the SIM/SD slot, which removes easily with the included tool. This can hold two SIM cards, or one SIM card and a microSD card. On the right hand side of the phone, we find the volume rocker-style switch, and the power button. These buttons are tactile, and have a nice, stiff response. On the top of the phone we find the ever-so-convenient 3.5mm headphone jack, a sensor for the noise-cancelling mic, and antenna bars on either edge of the phone. On the bottom of the phone we find the USB Type-C connector, downward firing speaker and mic, and the antenna bands on either side like we saw on the top. The back of the phone is covered in a non-removable covering that is a textured material, which feels like a cross between silicone and plastic. I found this material to feel nice in the hand, it was easy to get out of my pocket, and felt very high-end. Let me just start off by saying that I am an iPhone user, and have been for years, but this ZTE phone wasn’t my first foray into the Android ecosystem. My last experience with Android was a pretty bad one; it was with the HTC One, and a long story short, the handset itself had issues, as did all of the garbage bloat HTC and AT&T loaded it up with. I always felt like the less the manufacturers augmented Android, the better, but the experience was enough to send me running back to iOS, where I have been happy ever since. Even though I am an iPhone user, the budget Android market as of late has really piqued my interest, as well as the seemingly recent mass-exodus from the phone makers of layering all kinds of horrible software on top of the Android OS. Here at Techgage we have reviewed some of the OnePlus models, and have been extremely impressed by its offerings, regardless of the budget price point. Without further ado, let’s get to this phone. The first thing I did with it was make sure all of my contacts were backed up to my Google account, and I made sure that my Apple calendar was completely synced with my Google one, so that all of my future and reoccurring events would properly sync. Then, I got right to the benchmarking (you can see those results above). Once I was finished with that, I wiped the phone and performed the sign-in process, and everything that goes with it. Everything here was pretty standard Google sign-in stuff. At the fingerprint part of the setup, I felt that the entire process was similar to that of iOS. First you have to choose a PIN, in case your fingerprint fails to unlock the phone, and then you place your finger on the sensor, following the on-screen instructions. You’ll be told to shift your finger around, and adjust your grip so that the sensor can get a detailed scan of your fingerprint. In daily use, I found the fingerprint sensor to be very accurate, and very snappy; in fact it would be very easy to forget it is even there with how well it works. After these initial steps, there were a couple more standard things to go through before I got to the main screen of the phone. Once I did get to the main screen of the phone, I was so impressed with how un-molested the instance of Android on this device was. There was no stupid counter-intuitive launcher, no extra menu layers, NOTHING! It was as close to a pure-vanilla Android experience as you can get without going to a Nexus or Pixel device. Overall, I found the phone an absolute delight to use. The menus were snappy, fluid, and well thought-out. I had the familiar feelings that I had the last time I delved into the Android ecosystem, the feelings of freedom, and being able to configure things and make modifications on such little details that iOS simply doesn’t offer (this is no surprise) like scheduled reboots, and power offs, requiring a password to power off, just to name a few. I performed side-by-side tests with my iPhone 7 Plus (retails at $869) against the ZTE Blade V8 Pro (retails for $230) and my results were really interesting. Most apps loaded at either basically the same rate, with some actually loading noticeably faster on the ZTE. Now, if you compare the benchmarks of this ZTE with my iPhone 7 Plus, the numbers are… let’s just say really far apart, which brings up the question of, how relevant are mobile benchmarks, really? I used this phone as my daily driver for a while, and never had a lockup, or an app crash. The Wi-Fi performance is fantastic, matching the performance of my iPhone 7 Plus (my home Internet is ~125/25), and the ZTE Blade V8 Pro had no problem saturating that pipe when running speed tests. The range was on par with other wireless devices, as well. The LTE performance was also comparable to my iPhone, and call quality was satisfactory – no complaints. I also paired this ZTE to my car, which has the MyFordTouch Sync system, and it worked flawlessly; music streamed steady, controls functioned from my car as expected, and the device paired immediately to my car, and stayed paired. I also used this phone with my Bluetooth headphones, and never had issues there, either. Finally, I also tested this phone being paired with my Pebble Steel smartwatch, and found the performance to be great, with no disconnects or odd behavior. Now, of course there are going to be some things you are going to sacrifice at this price point; it’s just something you can’t get around. The speaker on this phone as many other reviewers have claimed, is pretty “meh”. It needs to be much louder. The ZTE Blade V8 Pro features a 13MP dual-lens rear camera with 7 levels of brightness with the dual LED flash, and an 8MP front facing camera. The point of contention for a lot of people on any phone, is the camera. As I mentioned before, I have the iPhone 7 Plus, which has a great camera. Is it the best smartphone camera out there? That depends on who you ask, but everyone can agree it’s a great smartphone camera. I took some pictures around my house with both phones, and to me, the differences aren’t that far apart. Maybe someone with a better trained eye could pick them apart, but to me they both take great photos. None of these pics were retouched or edited in any way. I found video performance to be great as well, offering recording modes such as 4K, 1080p and lower options. All video is shot at 30 FPS, except for the night mode which is 10 FPS. The ZTE Blade V8 Pro also features slo-mo recording, 720p @ 120 FPS. If there was one thing I didn’t like about this phone, is that the navigation buttons are capacitive and located in the body, not on the screen. This means if you are used to touching your phone just below the screen on the bezel, you will be pressing the navigation buttons inadvertently. There are other phones that share this design, but those you can usually chose to push those buttons north onto the display, which I certainly would have opted for. I imagine after using this phone more, you could train yourself not to grab the phone on the lower bezel. In closing, this phone offers absolutely, hands down, amazing value. I don’t want to sound like a fanboy, but I just can’t help it: for $230 US, it’s a no-brainer if you are looking for a reliable Android phone with premium features and great performance. 5.5” 1080p display looks great. Inability (seemingly) to relocate the navigation buttons.